Navrathan, the ultimate destination for dazzling designer Traditional jewellery. Inimitable in style, innovation and impeccable in craftsmanship; every piece is one-of-its-kind. 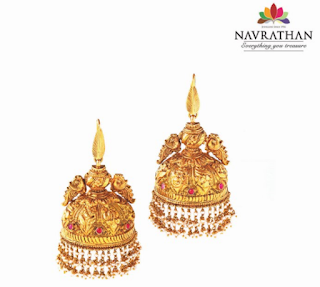 Since 1954, Navrathan Jewellers has been the choice of queens, in palaces and the greatest homes of Bangalore. Breathing life into India’s rich heritage of royal designs and craftsmanship, Navrathan is a bastion of temple jewellery, Belgian-cut diamonds, precious gems, and 22k gold and silver articles. Encrusted with precious stones such as emeralds, rubies, and south sea pearls, to create fine jewellery that adorned Kings and Queens from the Royal Indian era. This season Navrathan launches the mesmerizing and ‘must have’ collection which makes every woman feel beautiful. A perfect fusion of traditional and contemporary designs, every bit of jewellery at Navrathan is crafted with perfect finishing. 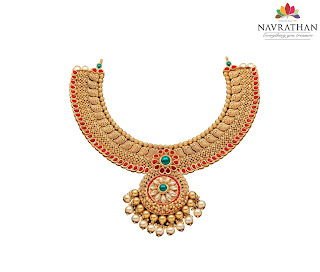 Image 1: Intricately crafted in the purity of gold with rubies embedded at the edges of the set. The center of attraction which elegantly takes the floral shape with white diamonds edged, uplifting the green emerald. Add glamour and style to your attire. 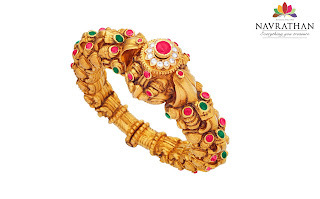 Image 2: This wide, antique finish gold kada is encrusted with red and green gem stones. The eye-catching head of the kada is embellished with the glimmer of Ruby. Image 3: The beauty of this ethnic necklace is intricately embedded with ruby and emeralds, polkies made by master craftsman in green emerald beads.